By now, you have finished reading about Shikoku and you know what to expect if you visit Shikoku. In this post, I’m going to be a little greedy and talk about my adventure, personally. Preparing for this adventure was a chore in itself. There are a million things to do, and a million things to plan. I purposefully left everything till the last few weeks, but kept a basic plan in my head. I never even had a good idea of how long I’d like to stay in each area until a week before leaving. In fact, I never even locked my plans on how to get to Shikoku until the last second, literally. I decided to take the ferry, roughly two nights before I left, and didn’t even reserve a spot until the day I left. There are two main reasons why I chose to take the ferry. The first, I didn’t feel like riding for 8 hours on the expressway, getting lost, looking for gas, and generally being bored on my own. 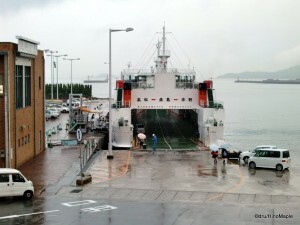 The main reason I took the ferry was that a friend of mine was also heading to Shikoku at the same time. 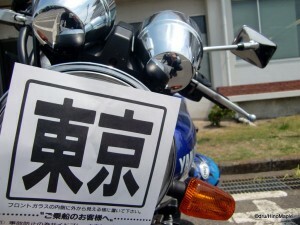 Instead of driving, or riding a motorcycle, he and a friend of his decided to ride their bicycles from Kochi to Matsuyama. It was also a great adventure, and I felt honoured to be starting our journey together. In fact, we almost didn’t even start together. They barely made it onto the ferry as they were late arriving at the terminal. On the ferry, I also met a German man who was on a trip to Kyushu. It takes roughly two days to reach Kyushu, but we had a great time drinking, eating, and talking. I believe I made the right decision. Please subscribe to his main Weblish Podcast (Episode 40 a~f) to see his own documentary of his trip in Shikoku. 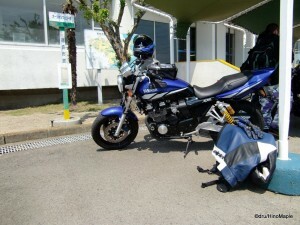 Upon riding down the ramp at Tokushima, I had to wait roughly 20 minutes for my friend to arrive. He had to get gas, and he also got lost looking for the terminal. I was getting antsy to get out as it was a beautiful day and I was hoping to head up to Naruto for the whirlpools. As we were looking for the hotel, we had a little accident. My friend dropped his motorcycle. This was our only bad luck, in terms of riding. It took us about 30 minutes to find the hotel, but when we did, we were just happy to be in Shikoku. My friend, however, had no energy and needed to get off the bike for the day. This would actually be the mood of the entire trip. Ride a little, and then relax for the afternoon and night. We toured Tokushima before going to bed. The hotel was great, and I wish I could have gone back. The owner had a big Ducati in the garage, free motorcycle parking, and free wifi in our room. What more could we ask for? He even gave us a little advice when we left for our trip. Unfortunately, when we returned to Tokushima, the hotel was fully booked. Riding down route 55 was excellent. It was our first full day, and like any other adventure, we got lost. The first time we got lost was when the road just stopped. They were still building a bypass. Thankfully, we needed the break anyways and it was relatively easy to get back on route. We got to see pretty much everything I wanted to see, in terms of sights. We saw a dam, the beach, and the cape. It was a beautiful road and I wish I could go back again, someday. I’m not finished with Muroto. I only wish I had an extra 10 hours to enjoy some of the sights that we passed, especially the beaches. Kochi was our first rest day. Since we don’t ride much, it was a good opportunity to keep our batteries full. We had a great time walking around and seeing all of the people. My only regret is not bringing flip flops to walk around in. It was only the third day and my feet were already starting to hurt from walking in motorcycle boots. This was also the day that we decided to not use our motorcycles aside from getting from A to B, as we didn’t want to look for parking, and risk getting lost. It is way too easy to get lost, especially without a navigation system. We did have a map, but it was for the entire region, so it wasn’t detailed enough for us, wherever we went. If I lived in the area, I would definitely want to explore the area a lot more. Our next leg of the trip took us from Kochi to Ozu. 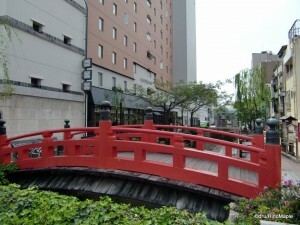 We had a tough time finding a hotel as we were in the middle of Golden Week. We were lucky to find a room in a town we wanted to stay in. We thought about taking route 56 all the way to the second cape, but thought we had better skip it as we took too much time taking route 55. We also started our adventure on the expressway for the first time. I can’t tell you how much time you can save if you take the expressway. People go much faster, and there are very few cars. It’s expensive overall, but well worth it, even for short distances. We cut through the middle of the cape to reach Uwajima. 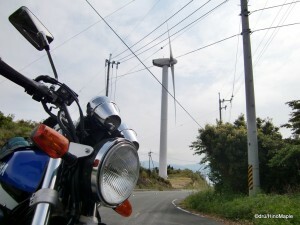 We had several plans for the day as we didn’t know how long it would take us to reach Ozu. We decided that taking a junction to Uwajima, first, and then heading north to Ozu would be better as we had a lot of time. We got lost in Uwajima, but that was to be expected. We were more lost when we were in Ozu. We saw a beautiful European style castle or palace on the side of the mountain, but we didn’t have time to go looking for it. We both thoroughly enjoyed Ozu. It was the kind of small town Japan that you can only dream of. It wasn’t very small, but small enough that you can walk everywhere. The town had a train running through every hour or so, the shops closed very early, and there really wasn’t a lot to do except enjoy the scenery. It was extremely peaceful. 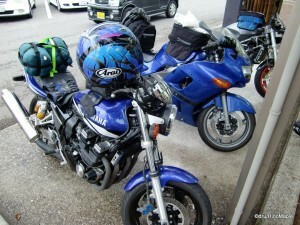 Our final touring leg was to head out to Misaki and then head to Matsuyama. This was probably the biggest disappointment of the trip for me. Misaki turned out to be nothing special. It was a nice challenge, but the area wasn’t that beautiful. It could have been all the clouds, but I’m not too sure. I enjoyed the coast from Ozu to Matsuyama, and loved the beach at Futami. I hope to return someday and just spend a few hours relaxing. We spent a little too much time there, and we were very anxious about Matsuyama. Being the height of Golden Week, we had no place to stay, and we might have to find an internet café or something. Thankfully, we found the Matsuyama Guest House, with an excellent host. We met many great people and had the time of our lives. I can’t say how greatful I was for staying there. My only problem was the two men we shared a room with. They were Americans who were hiking along the 88 temple route. Matsuyama was their last stop before returning to Tokyo for work. I can’t describe the stench that they and their clothes produced, but needless to say, I didn’t sleep well. I got up early the next morning and went for a walk on my own to collect my thoughts. It was about the time that my friend and I were starting to feel a strain on our relationship. There is only so much two people can do together before they start to get upset at each other. They can be the best friends in the world, but unless you live with them for a long time, it can be difficult. Matsuyama itself was a great place, but not a place that I would want to visit again. I came, I saw, I left. I wish I went to the Dogo Onsen, and I would love to visit the Dogo Brewery again, but in reality, there isn’t much for me to see or do anymore. After Matsuyama, we had to decide whether to risk heading to Takamatsu, with a chance of showers, or stay another day in Matsuyama. We decided to risk it as the chances were low. We weren’t so lucky this day. We had a small shower on the expressway, and another one when we got in to Takamatsu city itself. It took us a little while to find our way to the hotel, but overall, everything was fine. We had a free computer in the hotel, and they even covered our bikes so it wouldn’t get too dirty from the rain. The hotel was run by an older couple, like a family business, but it was part of a small franchise. We were thinking of heading to Kotohira before getting to Takamatsu, but we changed our plans when we saw the weather forecast for the day, and also when we thought about parking. We also made our first big mistake of the day. We tried to take a train, but misread the timetable. Instead of having an extra train on holidays, it said there was NO train on the holidays. We had to wait at the station for over one hour. We could have walked back, but in our motorcycle boots, probably not. We also didn’t know about bicycle rentals, which would have helped us a lot, but that’s for our next trip. We used Takamatsu as our base for three nights. We spent a day in Kotohira and a day in Naoshima. There isn’t much to say or add as my previous posts describe it much better. 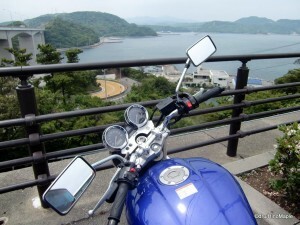 My only regret was that it was raining so much in Naoshima that I didn’t get a chance to ride a bicycle on the island. I will definitely have to return for that adventure. At the time, I didn’t know about an island called Shodoshima. It is another famous island that is close to Naoshima. 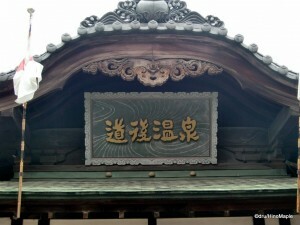 It is famous for being the olive capital of Japan, and known for a replica 88 temple pilgrimage. 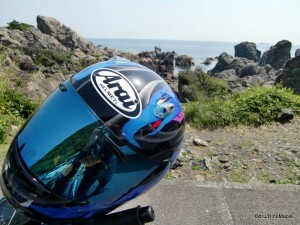 Thankfully, I can also reach this island from Okayama, which is a place I’m considering to visit. Okayama is famous for its black castle. It was built to rival Himeji castle. It would make a nice long weekend trip, if I get a chance. If I do return to Takamatsu I will definitely have to enjoy the delicious Udon, but for now, I’ll be content with the udon in Tokyo. Takamatsu is no longer on my list of places to visit. Upon returning to Tokushima, I finally got to see one of the main things I wanted to see since I started planning my trip. The Naruto Whirlpools are famous in Japan and I had to see them. I was a little sad that we didn’t see them when we arrived, but I was still very happy to see them at the end of the trip. By this time, my friend and I had nothing to really talk about, and we were basically trying to plan the end. He ended up leaving a day early so he could be with his girlfriend and also go to a food festival in Osaka that was held once every four years, or something like that. I couldn’t blame him at all. I would have done the same. My only problem was that the ferry I wanted to take was fully booked and I didn’t know if I could go home the next day or not. 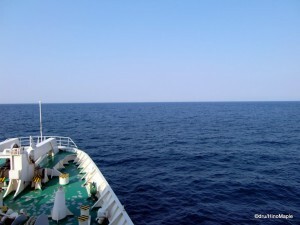 The day that he left Shikoku, I had a full day to myself and my thoughts in Tokushima. The city itself is very boring unless you get out. I didn’t want to do that as I was tired from the travelling and really wanted to go home. I ended up just walking back and forth in town until my feet gave up. I had to change hotels as well because the one I stayed in was fully booked that night. Needless to say, I had a restless night. The morning of my potential departure from Shikoku was an early one. I arrived at the ferry terminal very early, about 1 hour before they even opened. I was the only idiot there that early. I got my ticket to wait and didn’t even know if I could get on or not. About one hour before we could board, one of the staff said I had a place, but I couldn’t understand him well enough. Thankfully, I met a very nice old man, who reminded me of Mr. Miyagi from the Karate Kid (“Best Kid” in Japan). He was kind enough to help me, just a little. We did have a nice conversation before boarding the ferry. The ferry ride home was the same as when I went to Shikoku. The only difference was that I had my own bunk, and there wasn’t a “restaurant”. Instead, they only had vending machine food. It was still good enough. I ate and drank all day and night until it was time to sleep. I can’t tell you how different it was to sleep in a bunk versus the floor of a tatami room. The only problem was that the curtains of the bunk kept all the air in, and I woke up suffocating in my own carbon dioxide. Arriving in Tokyo, I was greeted by the fresh morning air; it was about 6 am. I had a nice short ride home where I put my things away and could finally say “tadaima” (I’m home). This entry was posted in Automobiles, Shikoku and tagged 88 temple pilgrimage, 88 temple walk, accident, Adventure, beach, Best Kid, bypass, cape, castle, dam, Dogo, Dogo Brewery, Dogo Onsen, dru, Ehime, Ehime-ken, Expressway, ferry, flip flops, Futami, golden week, Guest House, Guesthouse, Himeji, Himeji-jo, holiday, holidays, hotel, japan, John, Kagawa, Kagawa-ken, kansai, Karate Kid, Kochi, Kochi-ken, Kochi-shi, Kompira, Konpira, Kotohira, kyushu, lost, Matsuyama, Matsuyama Guest House, Matsuyama Guesthouse, Misaki, Motorcycle, motorcycle boots, Mr. Miyagi, Muroto, Naoshima, Naruto, Okayama, olive, olive capital of Japan, osaka, Osaka-shi, Ozu, Ozu-shi, podcast, route 55, route 56, Shikoku, Shodoshima, small town Japan, Takamatsu, Takamatsu-shi, terminal, Tokushima, Tokushima-ken, Tokushima-shi, tokyo, Tokyo-to, train, udon, Uwajima, Uwajima-shi, Weblish, whirlpool, wifi, XJR, XJR 400, Yamaha, Yamaha XJR 400 R, ことひら, みさき, むらと, オトバイ, バイク, ヤマハ, 九州, 四国, 大洲, 大洲市, 姫路, 徳島, 徳島市, 徳島県, 愛媛, 愛媛県, 日本, 東京, 東京都, 松山, 松山市, 橋, 琴平, 金毘羅, 香川, 香川県, 高松, 高松所, 高知, 高知所, 高知県, 鳴門 by Dru. Bookmark the permalink. Hey Dru, nice to meet you! I’m a fellow Japanophile and I live in Shikoku. I understand you live in Tokyo – is that still true? And, you’re from BC – just a stone’s throw from my native Seattle! (One of the JET guys I met here now lives there in Vancouver.) It was fun to see the places you’ve been in this area – you write quite extensively about all the destinations! (I’m must more, um, taciturn on my blog). I’m a cyclist rather than a motor biker, but do you ever go hiking? Let me know if you plan to visit Shikoku again! Yeah, I’m still in Tokyo. I was just reading a bit of your blog and moving an average 2 times a year sounds painful! I have only lived in 2 places in Tokyo. In actuality, I am from Vancouver, so it isn’t just a stone throw’s away. Feels closer.